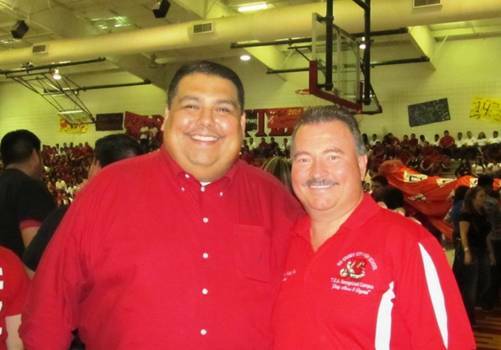 State Representative Ryan Guillen (D-Starr) (left) stands with Rio Grande City High School Principal Adolfo Peña Jr. (right) on Sept. 8 during a football pep rally. After delivering a motivational speech for the football team of his alma mater at the event, Rep. Guillen congratulated the Rattler football players on their win Thursday night. The Rattlers defeated the Mercedes Tigers in Rio Grande City by a score of 39 - 28.